Bridgestone’s Treo Soft golf balls offer accuracy and control for golfers with moderate swing speed. The Treo Soft golf ball feature a soft Gradational Core construction to create ideal compression and energy transfer at impact. Seamless Cover Technology features a 330 Aerodynamic Dimple design to optimize trajectory and help golfers achieve truer ball flight. Enhance tee-to-green performance with the Treo Soft golf balls. Gain accuracy and control by playing Treosoft Golf Balls. Engineered for golfers with moderate swing speed, Treosoft Golf Balls feature a soft Gradational Core construction designed to create ideal compression and energy transfer at impact. Seamless Cover Technology features a 330 Aerodynamic Dimple design to optimize trajectory and help golfers achieve truer ball flight. Enhance tee-to-green performance with Bridgestone® Treosoft Golf Balls. 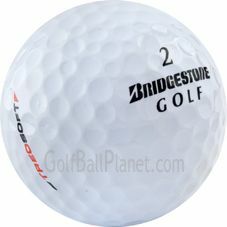 Bridgestone Treo Golf Balls are perfect for golfers of all skill levels with swing speeds less than <105 mph.